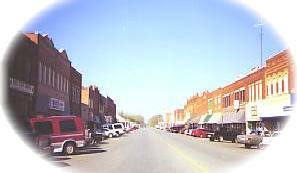 Welcome to Anadarko, Oklahoma, the Indian Capital of the Nation, the door to the Old West, the gateway to the Great Plains, and the home of Indian City, U.S.A.
You are about to turn back the pages of history our town of over 100 buildings on the National Register of Historic Places. These are the Tonkawa Hills, named for the Tonkawa Indian massacre on October 24, 1864. Anadarko is a unique name, named for the Nadarko band of Caddo Indians. The city of Anadarko was founded on August 6, 1901, when the surrounding Indian reservations were opened to white settlement through the auction of lots. Tour the seven Indian villages of Indian City, U.S.A., built under the supervision of the University of Oklahoma. See the Apache wickiup, the Pawnee earth lodge, the Kiowa winter camp, the Pueblo adobe, the Caddo houses, the Navajo hogan and the fabulous Wichita grass house. See the Southern Plains Indian Museum and Crafts Center to view the American Indian past, present, and contemporary works of art. Visit the National Hall of Fame for Famous American Indians. A self-guided tour of the outdoor sculpture garden is available at no charge. Sidewalk pavers display an Indian mosaic design of the teepee, fire and arrows representing home, warmth and protection of the home respectively. - CLOSED UNTIL FURTHER NOTICE - The only authentic restoration of American dwellings and way of life in America, Indian City, U.S.A. is on the site of the massacre of the Tonkawa Indians by a band of Shawnees and other mercenaries during the Civil War. The bronze sculpture stands in front of the Caddo County Courthouse with the inscription "In Memory of Our Brave Boys."